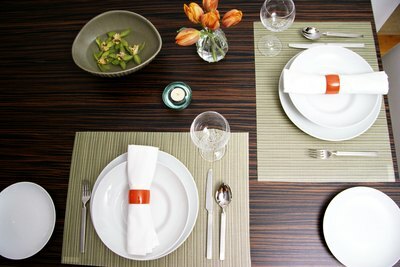 Setting a formal dinner table and using all the cutlery can be confusing if you plan to use a complete set. Although not obvious, the proper placement of dinner silverware is based on its logical use. Hosting a formal table can be fun, but an important fact to remember during any dinner party is to make your guests feel comfortable. 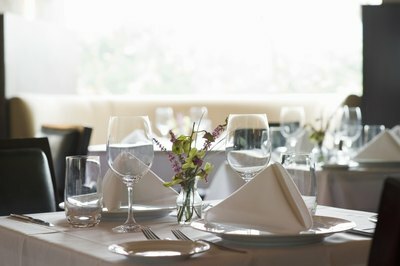 According to the "Dining Etiquette Guide" found on WhatsCookingAmerica.net, a complete dinner setting of cutlery includes three forks, one dinner knife, two spoons and a butter spreader. Place all forks to the left of the dinner plate. The dessert fork is the closest to the dinner plate. The dinner fork is the largest and is placed to the left of the dessert fork. Salad forks are on the far left. Napkins are on the far left of the forks. The first piece of cutlery on the right side of the dinner plate is the dinner knife. Place a teaspoon to the right of the knife. The soup spoon is larger than the teaspoon and is set on the farthest right side. The butter spreader is a small knife that lies across the individual bread and butter plate. The bread and butter plate goes at the top left of the dinner plate. Use the silverware that is the farthest from your plate first, and work your way toward the dinner plate. Serve soup and salad before the main course. The soup spoon is on the far right, and the salad fork is on the far left. You will not use these two utensils again for any other part of the meal. Rest your fork or spoon on the plate, and it will be removed when you have finished that course. Silverware that is not used can be left on the table. Remember a simple rule to distinguish your food and drink from that of your neighbors. Eat to your left and drink to your right. Stemware sits at the top right of your dinner plate. This includes a wine and water glass. Cutlery that has been used and that is still being used should not be laid directly on the table. Place your silverware on your plate until you use it again.